I received this very informative article the other day in my email box. I asked the author of the email, Shelly Rosenberg, if I could share it on my blog. She graciously agreed and said the article was written by a new member of the Nashville Herb Society. Shelly writes the newsletter for the Herb Society of Nashville - Link at the end of this post. I also included a link to Shelly's page should you ever need her professional editing and writing skills. As summer draws to an end and as you look forward to fall, you might consider pruning your rosemary. It is not necessary to prune rosemary but many prune in order to shape or contain its size. Rosemary may be pruned in late spring or summer but should be pruned no later than 4-6 weeks before the first frost. If rosemary is pruned too close to the time of frost, the new growth might not have time to harden making it susceptible to winter damage. Before you begin pruning, make sure that your pruning shears are clean and sharp. Dull or dirty shears may cause ragged cuts that are vulnerable to pests. Rosemary may be pruned back as much as 1/3 at any one time but further pruning should be after 2 to 3 months. Individual branches may be pruned back by ¼. If you make the decision to prune, what should you do with your harvest? 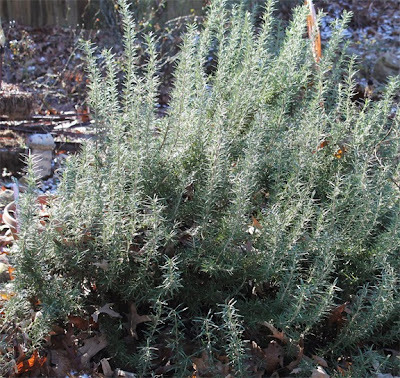 Many dishes are enhanced by rosemary. One of the most popular uses is with lamb. Rosemary is thought by some to have both a strong taste and smell so should be used sparingly. One popular method is to use a rosemary sprig dipped in olive oil as a replacement for a basting brush for a subtle flavoring. One way to take advantage of your harvest for months to come is to make rosemary herbed vinegar. A recipe for the cold method is listed below. Pour a small amount (approximately ½ cup) of the vinegar into a small clean bowl to reserve for later use after the herb sprigs have been added. Place the fresh rosemary sprigs in the bottle of vinegar. Top off to fill the bottle with the reserved vinegar and seal tightly. Place the bottle on a sunny window sill for 3 to 4 weeks, gently shaking the bottle every day or so to mix the flavors of the herbs. This flavored vinegar is great for marinades for meat and poultry, in salad dressings and many other recipes requiring vinegar. It can be stored in the pantry for up to 3 months.